Posted on 13 November 2006. 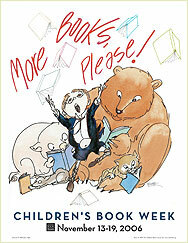 > The 87th Annual celebration of Children’s Book Week begins today. This year’s theme, More Books, Please!, features artwork by several notable illustrators, and encourages children and the adults who care for them to spread the joy of reading by spending some time with a book each day. Visit the Children’s Book Council website for ideas on how you can participate in this yearly event.